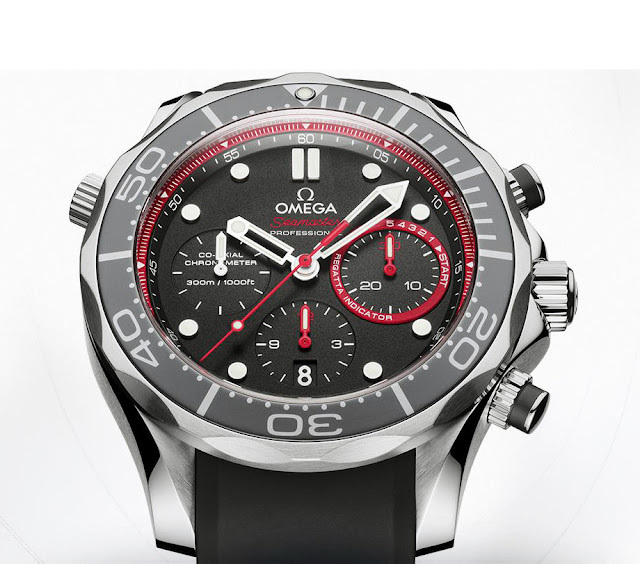 Omega is a long time supporter and sponsor of the Emirates Team New Zealand that will compete in the 34th America’s Cup, the sailing’s greatest trophy that will be held this year in San Francisco. To celebrate this partnership, Omega presented the Seamaster 300m Diver ETNZ Limited Edition, a robust chronograph powered by the Omega Co-Axial calibre 3330 which offers water resistance to 30 bar (300 metres / 1000 feet). The 44 mm steel case alternates polished and brushed surfaces with a matt black ceramic bezel ring. The black dial is also matt and encircled by a red seconds track. The central hour and minute hands are skeletonized. 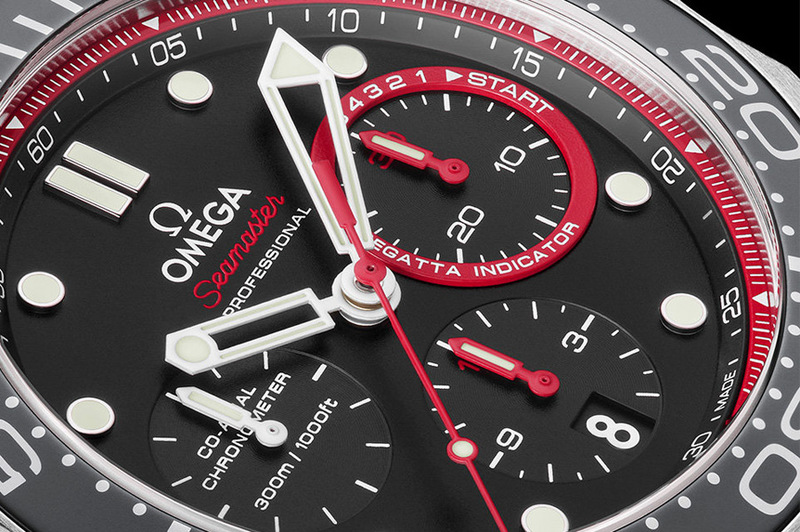 The small seconds sub-dial is positioned at 9 o’clock while at 3 o’clock we find the 30-minute chronograph recorder with a distinctive red ring marked with a scale that indicates the five-minute countdown to the start of a regatta. The 12-hour chronograph recorder is at 6 o’clock with the small date window. The hands of the chronograph counters - just like the central seconds hand - are red so offering excellent readability. The screw-in caseback is embossed with the “ETNZ” logo and the limited edition number (0000/2013). 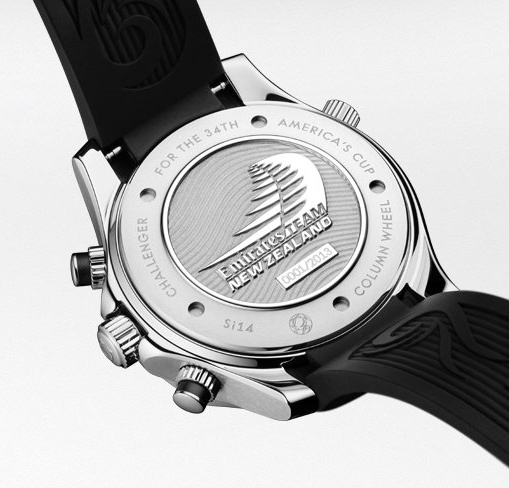 “Challenger for the 34th America's Cup" is engraved around the outside of the case back. The Omega Seamaster 300m Diver ETNZ Limited Edition comes with a black rubber strap but a steel extendable divers’ bracelet is also delivered. 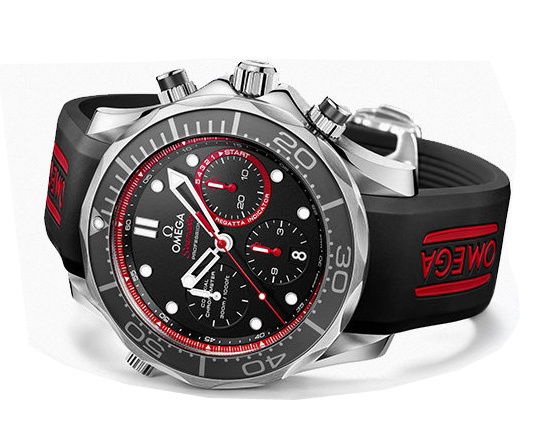 To celebrate the partnership with Emirates Team New Zealand, a challenger at the America' Cup 2013, Omega presented the Seamaster 300m Diver ETNZ Limited Edition, a robust chronograph powered by the Omega Co-Axial calibre 3330 offering water resistance to 30 bar.